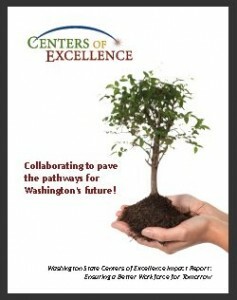 A core initiative of the Washington’s Centers of Excellence is to act as a statewide liaison to business, industry, labor, and the state’s educational systems for the purpose of creating a highly skilled and readily available workforce critical to the success of the industries driving the state’s economy and supporting Washington families. A top priority of Centers of Excellence is to serve the community and technical college (CTC) system to ensure activities generate products, services, resources, or research that supports the successful alignment of programs to correctly anticipate and meet industry needs and workforce demands. Centers of Excellence have demonstrated a firm commitment to serving the state’s community and technical college system. Please contact the Center if you wish to request a printable version of this report.